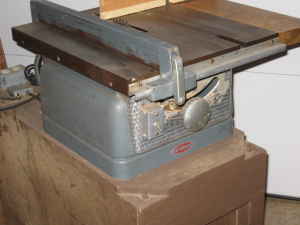 Known as the Craftsman "80" 8-inch Tilting-Arbor Bench Saw, this Craftsman Model 103.22160 8" Tilting Arbor Table Saw was made by the King Seeley Corp. under the Sears Brand. It dates back to approximately 1952 or 1953. This saw featured what Craftsman called the "Floating Drive." This "floating drive" was featured in Craftsman catalogs as being a new type of motor mount that stops transmission of motor vibration because there was no mechancial connection. The motor was mounted on a special support on the bench behind the saw. This resulted in smoother operation, easier tilting, and greater protection of the motor from sawdust. This floating motor mount automatically controls the belt tension for the most efficient operation. Notice that there is only one hand wheel while most tiling arbor saws had separate hand wheels for tilting the blade and for adjusting the blade height. This saw had one wheel that controlled both the angle and depth of cut from the front of the saw. It was also one of the first Craftsman saws to feature a rip fence with one lever that locked both the front and back of the fence. The saw features a large 20" deep by 17" wide cast iron table that was grooved on both sides for a miter gauge. The rip fence was made of tempered aluminum which was carefully ground for trueness. Maximum Blade Diameter: 8 inches w 1/2" diam bore. Recommended 1/2 HP 3450 rpm motor.